DIY Boeing 737 Overhead Panel - Part 1 - Building the Structure | Life, The Universe and ... Everything! Having spent many hours on my X-Plane flight simulator, I've come to start using my displays only for the "outside view" from the cockpit. This means having the flight control instruments in hardware as much as possible. I've achieved this to some degree with the "glass cockpit" monitors I added a while back. However, when flying the 737 I still need to use the "virtual" overhead panel, so this was a good next target to move to hardware. You can buy fully functioning 737 overhead replicas in ready made or kit form, but it can cost many tens of thousands of ringgit. In trying to curb the never ending expenditure of this crazy hobby, I decided to build my own. I don't need it to be a 100% perfect replica, but it should operate plausibly enough to achieve some level of "immersion" in the simulator. Part of the motivation for doing this is also to further my ability to make things ... after all, the journey is the reward, right? Inspired by Peter of Build a Boeing's videos, I started by building the structure for the overhead panel. 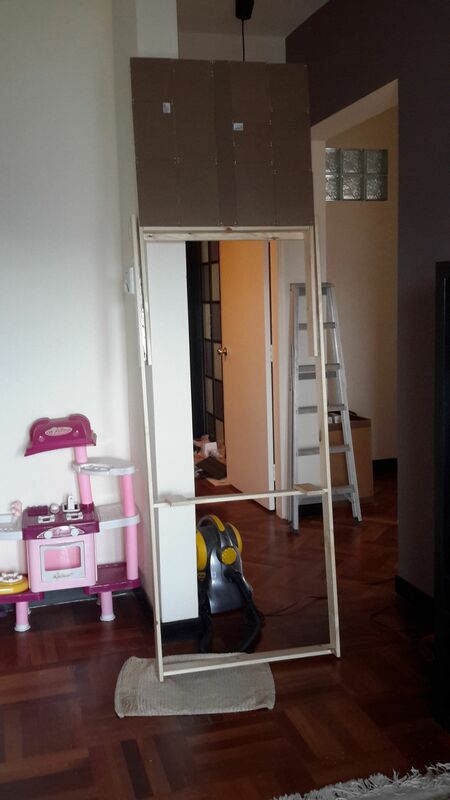 This consists of a frame to hold the individual panels, and a stand to hold the frame up. The overhead panel is to be mounted above my working desk -- it's not a full time flight simulator, and so it mustn't interfere with the desk's other roles as well. While having cramped surrounds adds to the immersive feel of being on a 737 flight deck, it is probably not the ideal place to get work done. A panel above my head would also block out some of the light so ideally it should be able to fould out of the way when not in use. 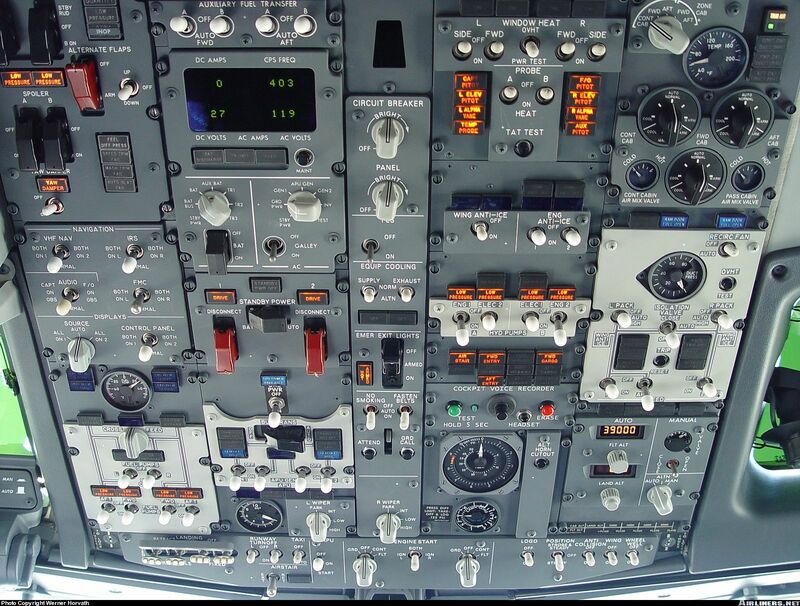 When deployed, it needs to be high enough so that I can get in and out of my seat, and also low enough that I can reach all the switches from a seated position. 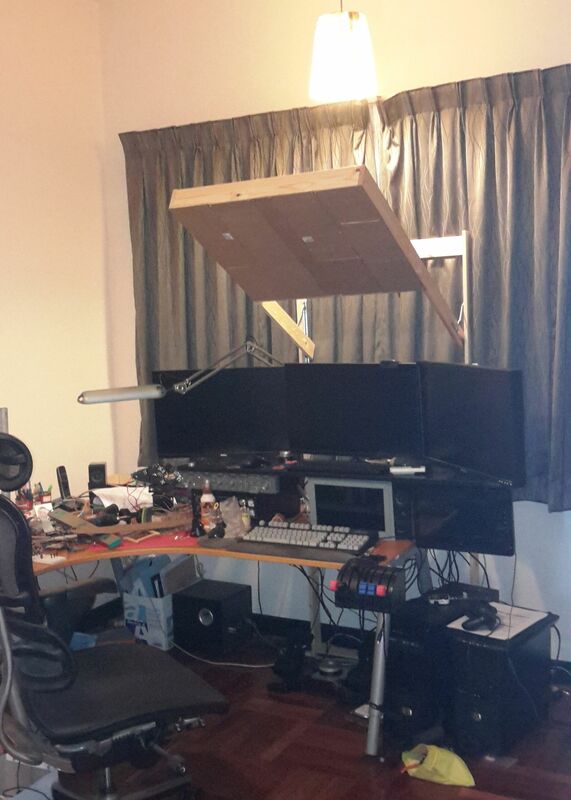 It also needs to clear the top of the 24" monitors on my desk. With my hands fully outstretched I can just about reach the top most part of the overhead panel. With the posts sitting on the floor, it would be carrying the entire weight of the overhead panel. 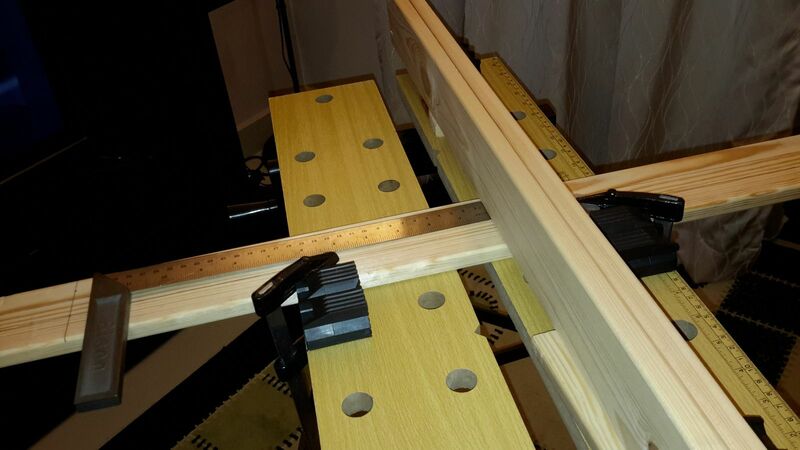 To prevent the panel from tipping forwards, I planned to use some of the wooden slats to make a sort of L-bracket below my desk, and drill some screws through my desk and into the bracket. The ideal material to build the structure from would be wood -- but where does one actually buy wood? Some people suggested to try hardware shops, or look for a sawmill. Most local woods are hardwoods and I was more concerned about weight than rigidity -- given my lack of structural engineering skills it was quite likely that the whole thing would come crashing down. So I needed something that had a decent strength to weight ratio. I did some googling and pine wood came up. Hmm ... there aren't that many pine trees around here. 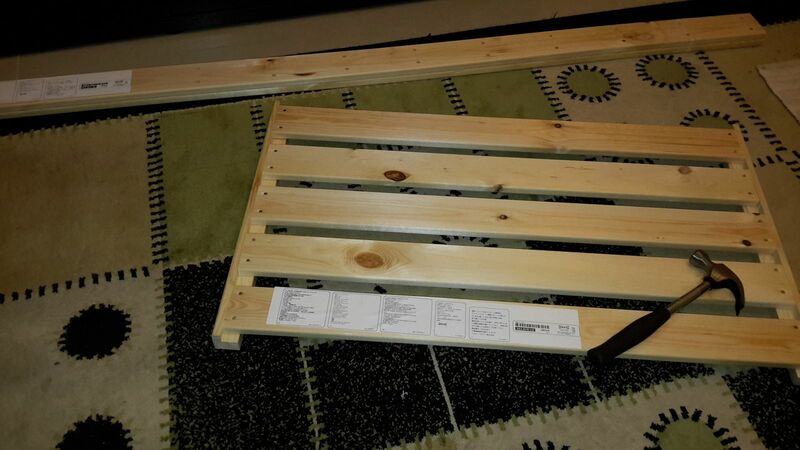 But then I found a major importer of lightweight pine wood just around my doorstep ... IKEA! This is the IKEA HEJNE series (btw: You can do a search for "pine" on the IKEA website and it will list all the items made from pine wood). To allow flexibility of configuration, they sell it in parts, and you buy what you need. A 1-section HEJNE rack weights 7.5kg ... and I don't really need the entire thing to build my overhead structure. 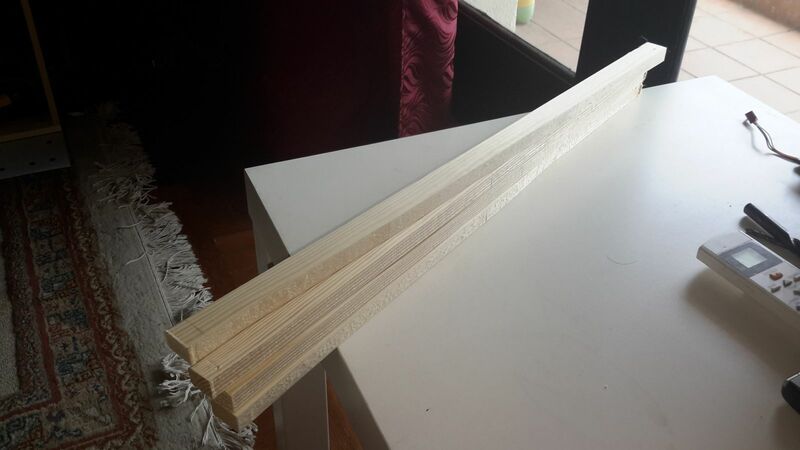 Two long posts could be cut down to form the sides of the frame, and if I can separate the wood pieces from the HEJNE shelf (they are about 70cm long, perfect for the overhead panel!) they will be useful too. 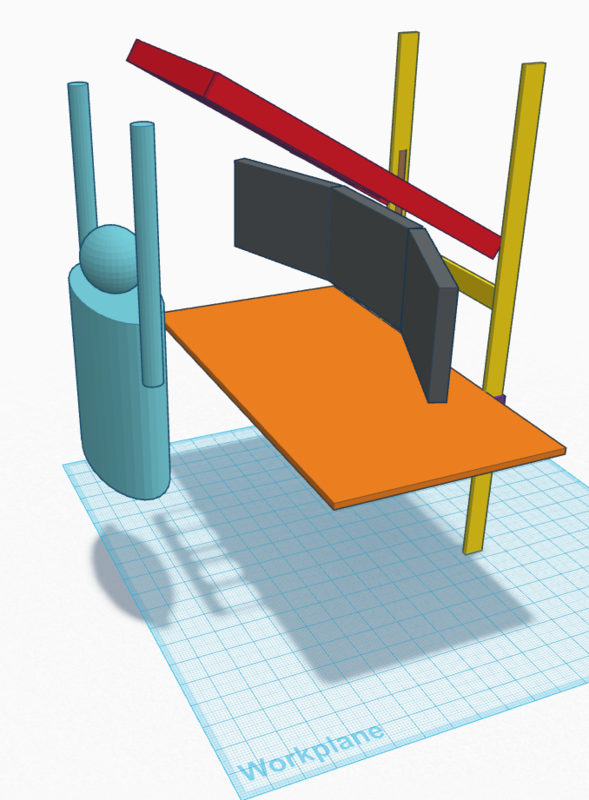 The HEJNE posts would also work as a stand to hold up the entire overhead panel. 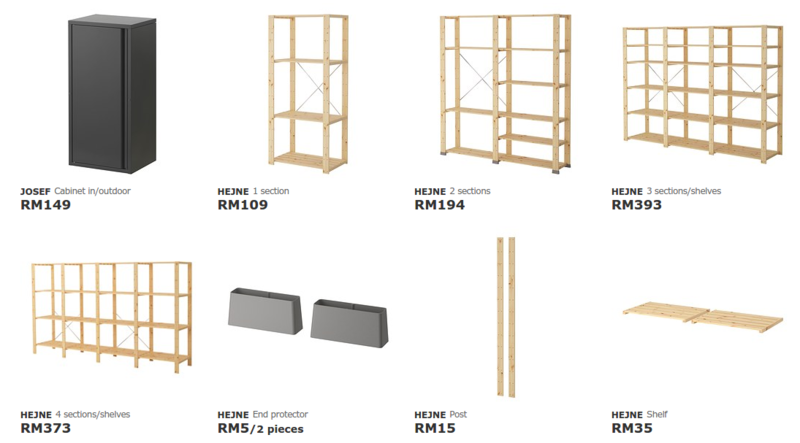 So I dropped by my local IKEA and picked up two sets of HEJNE Posts and one set of Shelves for total of MYR65. 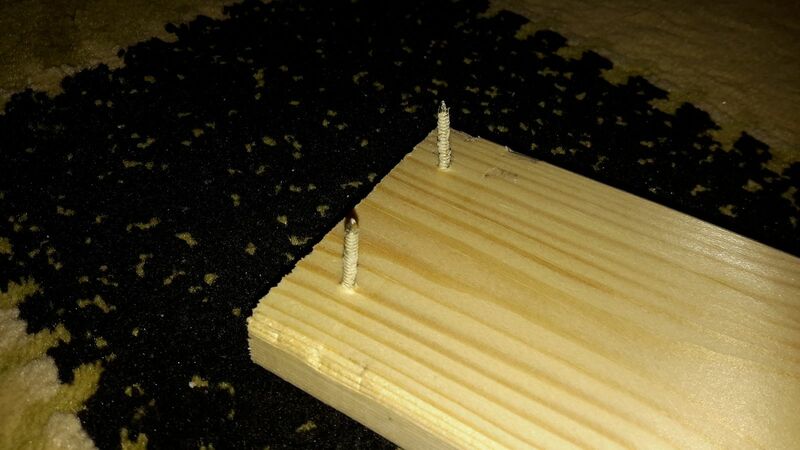 The next morning (can't be hammering stuff at night as I live in an apartment) I rested the slats on some pieces of wood (making sure there was nothing below the nail), gave each nail a sharp whack with the hammer and they were then easy to pry off from the other side. It was all much easier than I thought. 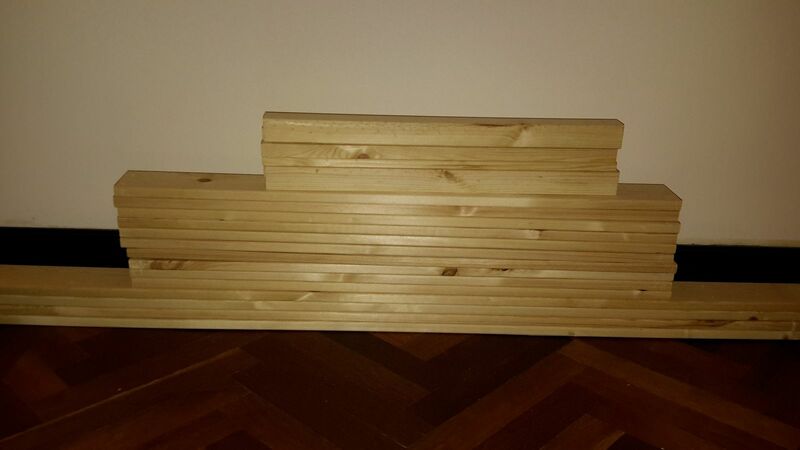 I now had a good supply of wood for building the frames. The next step was to lay everything out so I could get some proper measurements of what I need. Peter's overhead Illustrator file has the panels laid out apart so that there will be some margin space that you could wrap around each panel's base material. I managed to print each panel separately in Inkscape (I run Ubuntu on my main PC, and don't have Illustrator, but Inkscape reads .ai files well) by holding down shift and selecting the region of each panel, pressing Copy, opening a new document and then pressing Paste. I used this method to print out each panel onto A4 paper and then cut them to size. Since these printouts were just for rough use I reduced the alpha to 5% so as not to waste toner. 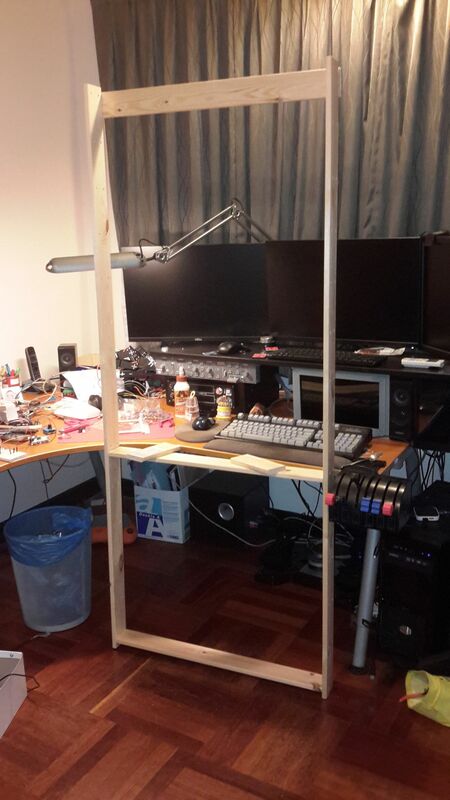 The outer frame box was easy enough ... two of the long posts at the sides (to be cut to sufficient length so that the bottom of the frame sits just above my monitors) and then one horizontal slat each at the top of the bottom. 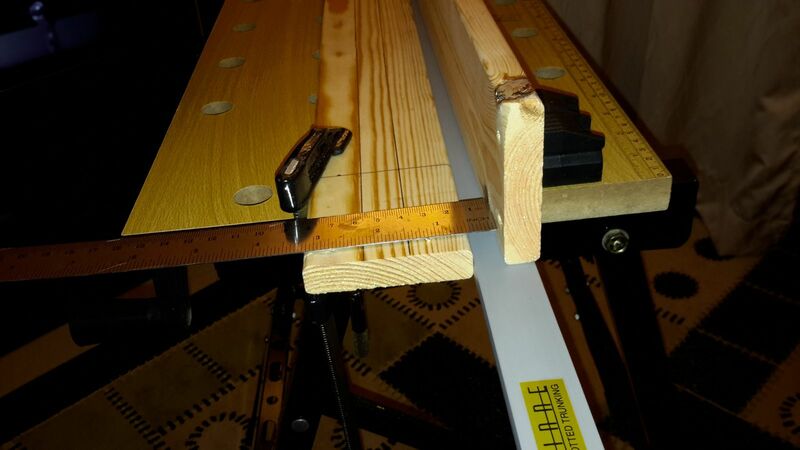 I measured the inside length of the horizontal slats 64cm and the vertical slats at 67cm. 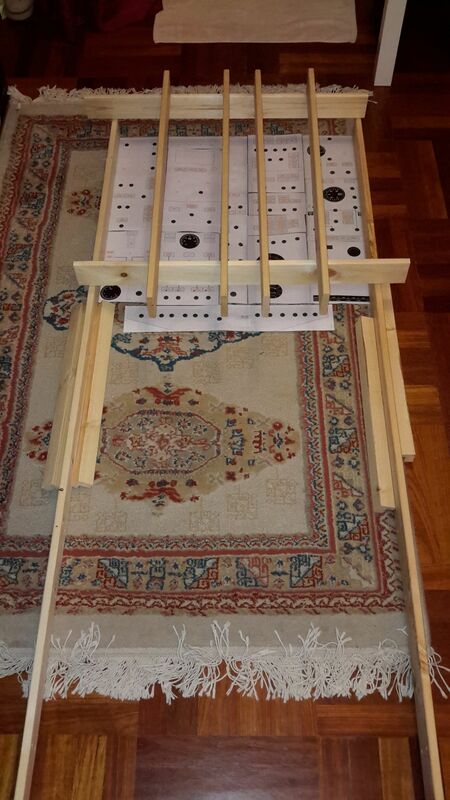 I also needed four pieces of wood to run from top to bottom so that I could attach the individual panels. Here I ran into some difficulties. 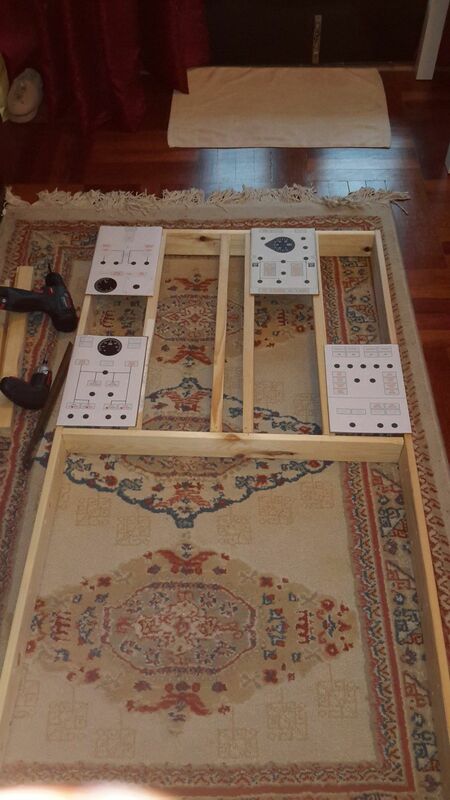 Most of the panels have 0.5" of space at the sides so that they can be screwed down to the frame. 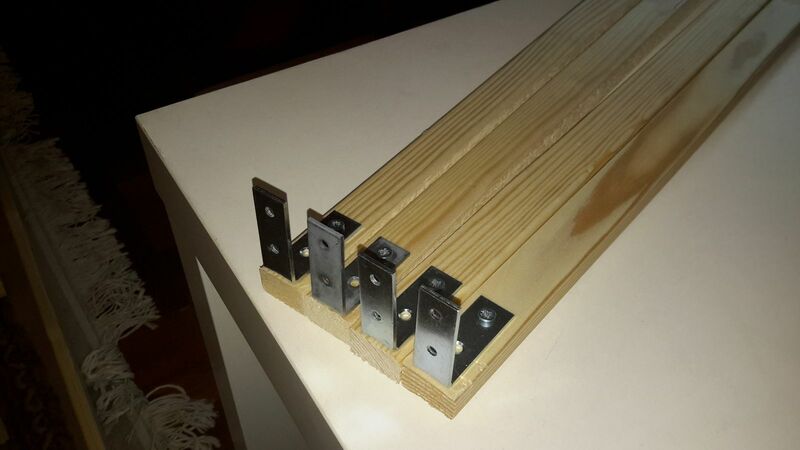 For the panels at the edges, these can just screw into the outer frame. But for the center panels, where two panels meet side by side, I would need a 1" wide support to be able to screw both sides down. But the HEJNE shelf slats were too narrow when standing them on their edges. I could use two pieces of wooden slats on their edges for each vertical run, but this would add a lot of weight. 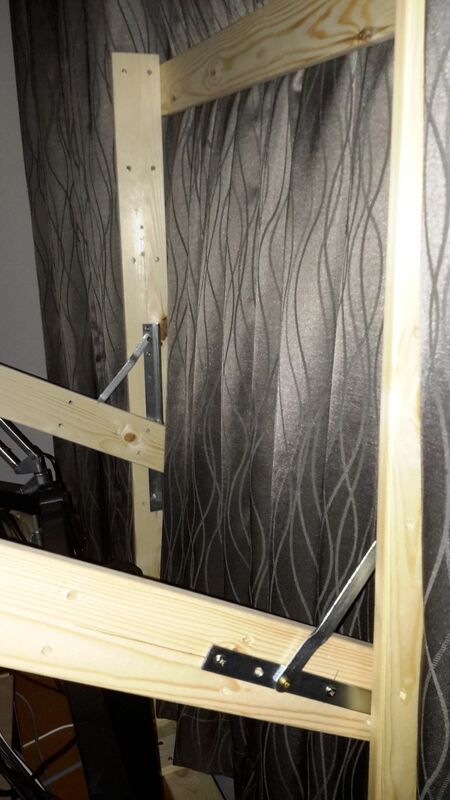 I can't put the slats flat as they're too wide, and would interfere with the components on the panel. The only power tool I have at hand is a jig saw. It's not particular easy to cut a long straight line with it. 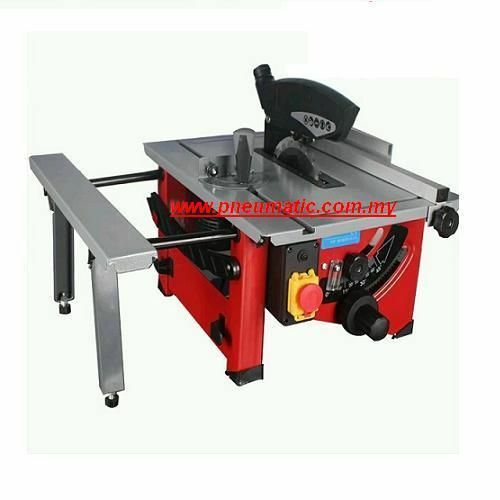 The ideal tool would be a mini-table saw, which would cut consistent straight long pieces. It would also be useful in ensuring the trimmed wood pieces had straight 90 degree edges. The cheapest one I found on lelong.com.my was around RM600, a made-in-china set with a 3-month warranty (which says a lot about the quality). Hmmm .... nah, I couldn't really think of much use for the table saw beyond this project, so I decided to give it a go with the jigsaw first and see how that turns out. I spent an evening trying to set up a guide rule for the cut. It's a balance of finding the right kind of object in the house that's straight and an exact size that you need (my jigsaw's blade is 3.5cm from the edge). As long as the piece to be cut and the guide were flush against those black watchamacallits, I could be ensured of a mostly square cut. The next morning I set the workbench up on my balcony and started work. I must say I was quite happy with the results. If there is just one power tool to get to work with wood for small DIY projects, I strongly recommend a jigsaw -- it's "good enough" for a wide variety of tasks. I sanded down the cut edges to make them cleaner. There was some slippage at some point so one of the pieces is not perfectly squared but as long as it's < 1" it's fine for my purposes, since these parts are not visible from outside. Next I needed to determine exactly where these slats should be positioned. The width of the all "wider" panels on the overhead measured 15.1 cm, so I cut out a few panels out of MDF to size. This is so I could ensure that the 1" mounting slats were placed exactly where they needed to be. To mount the slats on to the frame, I used L-brackets that I bought at Mr DIY. 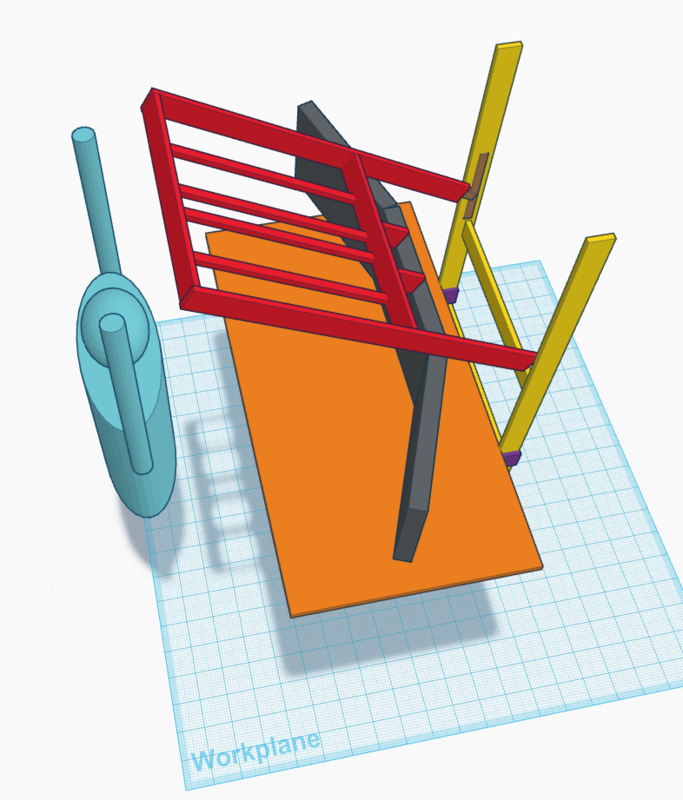 If you're really good at it, you can probably get away without the L-brackets (and save a few grams) by just driving a long screw into the frame and then lengthwise into the slat. I didn't want to take the risk of getting this wrong, given my accuracy. So now each panel has approximately half an inch of support on its left and right sides. (Yeah I left out the small stubs for the lighting and engine starter panel. I'll add these later). 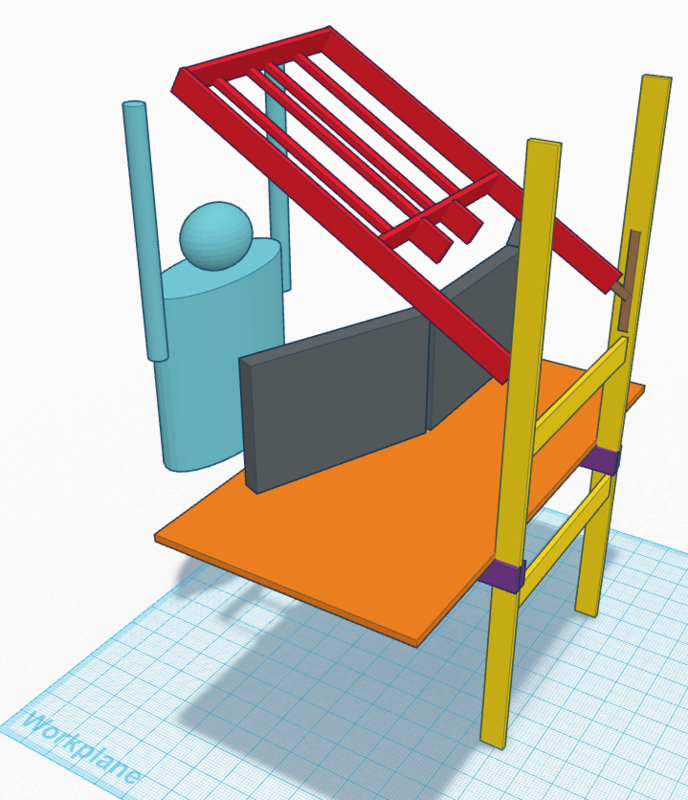 I'd already decided to use two of the HEJNE posts as stands, with some slats going across it for rigidity, and also bolting it to my desk for stability. I had initially thought to fix some door hinges to the bottom of the frame and use some string to the panel open (something like a drawbridge). But then I had a better idea from my toilet window. 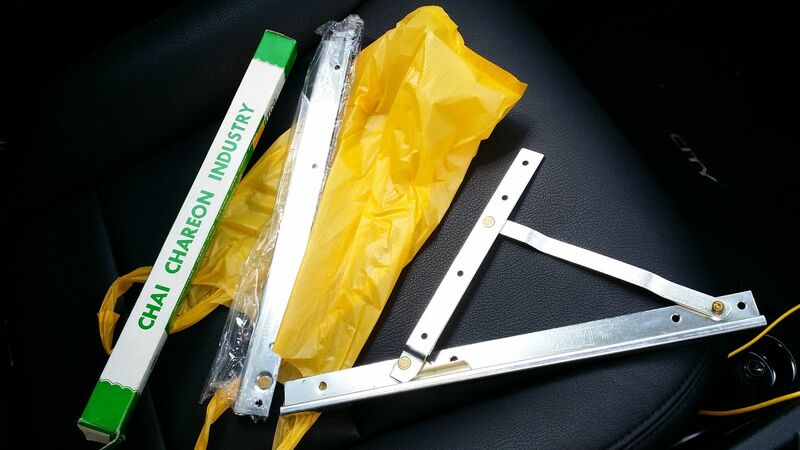 There are two bars on the friction hinge, one part mounts to the stands and the other to the sides overhead frame. 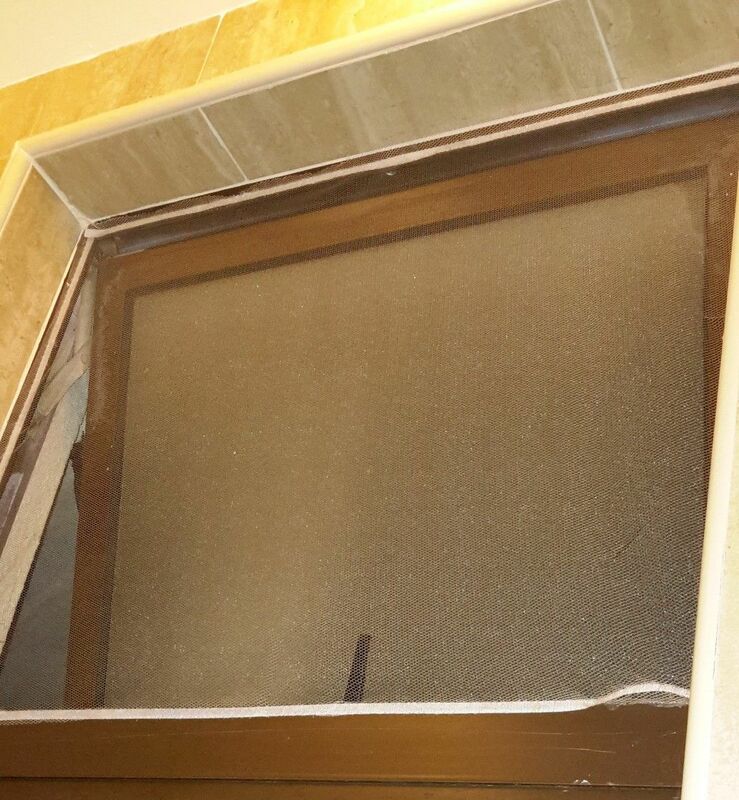 I planned to put this upside down compared to my bathroom window hinge, so that it would either stay vertically up, or open outwards at an angle. With a largish screw head in the 2nd hole to stop the panel from open fully, I measured a maximum opening of 30 degrees with this hinge -- close enough to the official 25 degrees that the real 737 overhead panel sits at. Time to put everything together! I started by positioning the stand next to my desk, so I could mark off the height at which my desktop sits. It's really light! 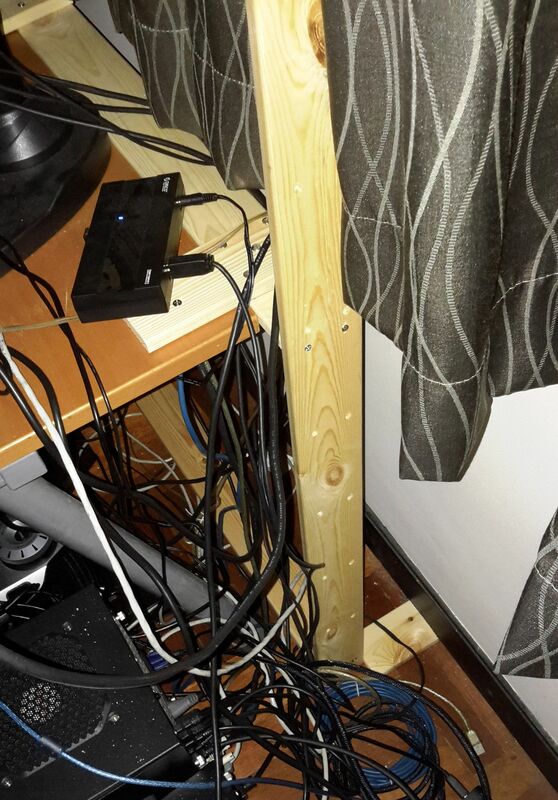 I then attached some wooden stubs to the stand that could fix it to my desk. While it was there I also estimated how high I would have to position the window hinges so that the overhead panel would clear my monitors. The next part was challenging ... getting the whole thing behind my desk. It's not that it's heavy, but it's large and there are a lot of wires and other obstacles to get through (I pulled out the electricity supply at the wall just to be on the safe side). Once behind my desk, I screwed the stubs into my desk -- I used a few screws just to be extra safe. 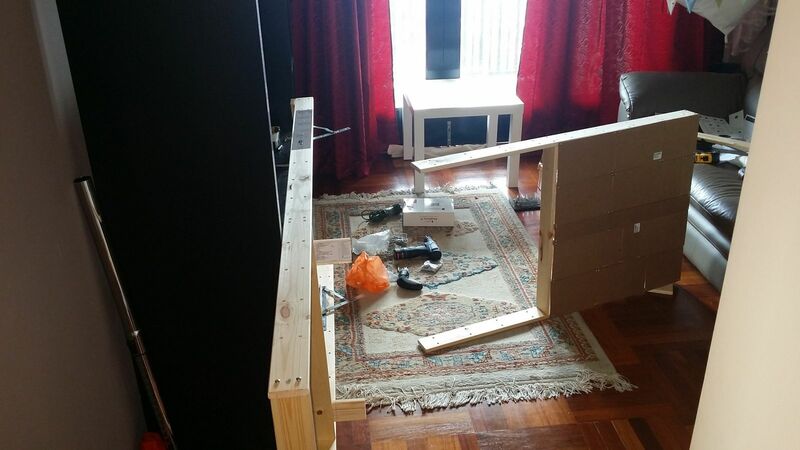 It turns out having just one mounting point to my desk was not such a great idea ... the stand had a tendency to tilt forward when the panel was opened. Since my desk is next to the wall, I countered that by fixing some more wood stubs, this time between the bottom of the stand and the wall. The hinges seem to be holding up the overhead frame quite well -- although I will add some string as a safety precaution in case the hinge fails. Hmm ... it does appear that my "agak-agak" (estimates) weren't so good as it is a tad bit high. Most notably the gap above the monitor is quite large and there's a lot of light coming in from the lamp above. The hinges need to be about a foot lower. I figured this is not the time to skimp. I did however decide to do something crazy and not take the whole thing out. I just detached the panel, and moved the hinges lower. 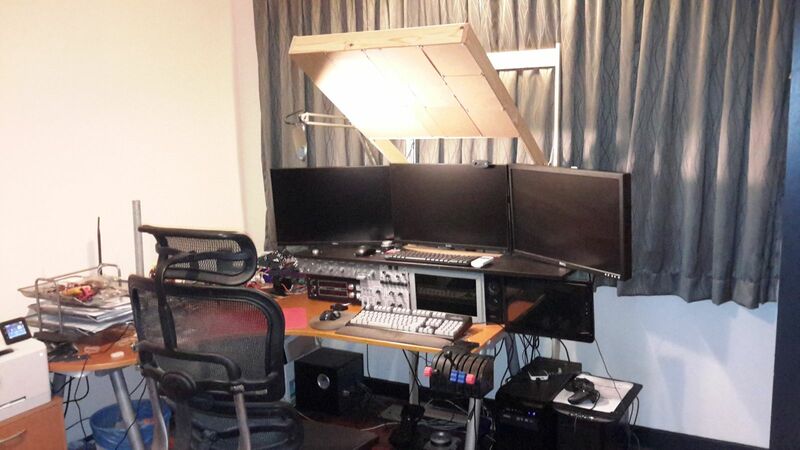 As I was alone, putting it back called for balancing the overhead on my head while leaning over my monitors, and with one hand positioning the arm of the overhead panel correctly over the hinge and another hand balancing a screw on the tip of a powered screw driver. In the end ... I got it just right! In, Part 2 of this series I'll start making the individual panels.